When Susie Fogg takes her dog for a walk, she dreams of having a more exciting pet. 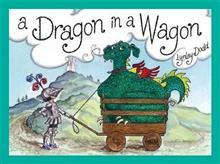 How fun would it be if Sam was a dragon in a wagon? Or a snake that eats cake? An wonderfully imaginative picture book that children will adore.